I'm hearing a lot of smack about how people dislike the new Facebook intently. 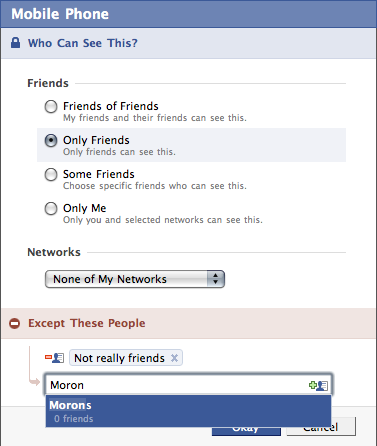 What people are kind of missing is how the new Facebook really helps you protect your privacy. Let's say you have some friends who are - to put it gently - technologically a few steps up from Homo neanderthalensis and bashing weird black blocks with sticks. These people may or may not be the same kind of people who randomly add friends, or are very loose with their passwords. These people present a liability to your privacy - private information about you can leak out through these people. On the other hand, there are some things that you really want to control the flow of information for regardless of how special/re-gifted your friends are. In these cases, you have a limited number of people that you wish to share information with. These limited groups of people have often anachronistic names such as "Family" and "Friends". While there is the possibility for confusion with using such nomenclature, it is often useful to remember that your "Family" is genetically related to you somehow, and are usually around you during Christmas and other holiday periods to inflict maximal pain and suffering. Similarly, your friends are the people who you see in the physical world more than once, and who you drink with to alleviate the aforementioned pain and suffering. Poking your friends just because you're bored may in fact lead to either them not being your friends, or a slap around the head. We have identified three groups of people here: The Friends, The Family, and The Privacy Train Wrecks (also known as Morons). Now, let's think of some scenarios where you can decide which of these groups of people should, and should not see your private information. Example 1: The mobile phone number. It's usually pretty handy to have contact details on hand on your Facebook page, so that if anyone needs to contact you, they've got a way to get direct access to you. Here's the thing though, you don't want these Morons getting access to your phone numbers. What you'd like to do is block them from accessing this. Conveniently, there's an option to do this. Simply go to your Profile privacy settings, go to "Contact Information" and click on "Edit custom settings" for your Mobile phone. In the "Except these people" area, start typing Moron Figure 1. 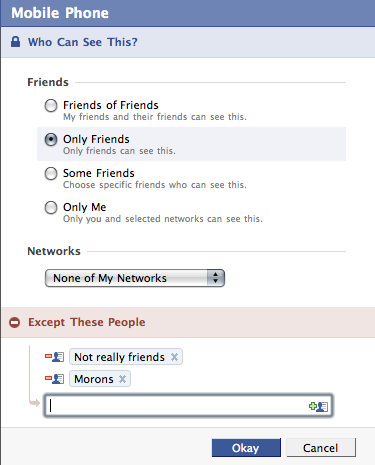 It should select the group for you. Once you select it Figure 2, you have now successfully excluded all Morons from seeing your mobile phone number. 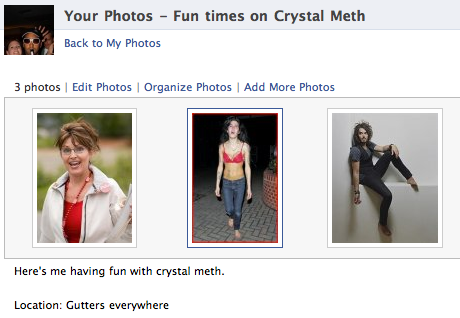 Example 2: Pictures from that time that you were shooting up crystal meth. Let's say, for example, that you're a big fan of crystal meth. I mean, who isn't these days Figure 3? The thing is, you were shooting up crystal meth at your last private party, and frankly, you don't want the whole world seeing what you look like. So, let's say you've got pictures from your crystal meth sessions that you only want to share with your family, since you know, they're paying for rehab. 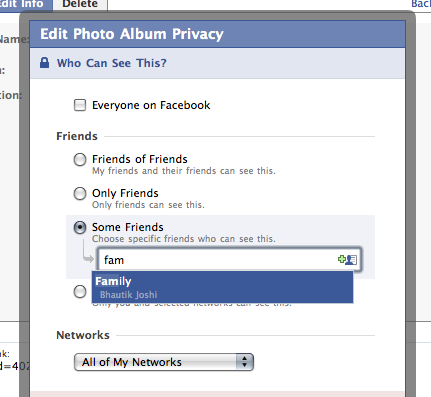 To let your family see your pictures, just go and edit the album that you are stashing your pictures in, and change the privacy settings Figure 4. 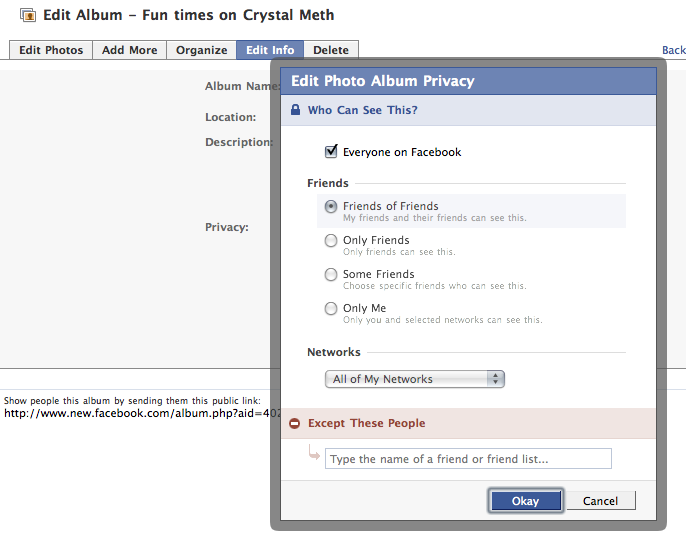 What you want to make sure is that some of your friends can see the album, and type in the group name Figure 5. Don't forget to change the network setting so that none of your networks can see the pictures. Now, you can be sure that only your family can see these pictures.